A magnificent traditional blond sandstone townhouse with generous and versatile accommodation within the sought after area of Kelvinside.This fantastic B listed late 19th century end terrace townhouse offers stylish and spacious accommodation over 3 floors retaining a host of period features including detailed cornicework, original panelling, fireplaces and stunning original stained and leaded glass windows. 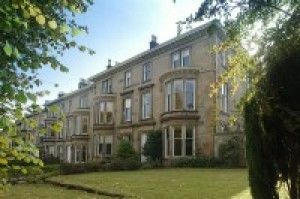 The mix of modern well equipped kitchen and bathrooms and classic period features retained in this magnificent house are well suited to modern family living.Woodburn House is built of blonde sandstone under a mainly pitched slate clad roof. The imposing elevated front entrance leads to the spacious family accommodation arranged over three floors comprising on the ground floor: A sitting room, kitchen, utility room, linen cupboard, study, cloakroom. On the first floor there is a grand drawing room, bedroom 2, family bathroom, cupboard. The second floor consists of a master bedroom with en suite bathroom and dressing room/bedroom 5,2 further bedrooms.Viewing strictly by appointment only with the selling agent.